Quiet, by Susan Cain, was the book I chose to bring with me to a slew of Doctor’s appointments. “Perfect,” I thought. “I can skim through this quickly while waiting.” I waived my husband off, suggesting that he run errands. As the frosted glass door closed behind him I sighed in bliss, ready to let the skimming begin. But alas, skimming was not in my future. Instead, word-by-word, Quiet pulled me in with stories of Rosa Parks and the Harvard Business School. Reading Quiet was like sitting on a cozy couch with a good friend, drinking a cup of coffee, and discussing what makes us tick. Susan Cain achieves this intimacy by combining research with personal experience. She made me question how I perceive the world around me, and made me reconsider where I fall on the Introvert-Extrovert scale. My introduction to introversion occurred when I took the Myers-Briggs test in graduate school. This test clearly does not work, I thought, since it had identified me as an introvert. I approached my instructor during the break to discuss the flawed test. “I go to my room, get changed into sweats and a t-shirt and read,” I answered. Silently I added, duh…if you’re tired, you definitely don’t seek out more stimulation! You have to recharge. “You are an introvert,” he said. “An introvert recharges quietly. An extrovert recharges through social interactions,” he explained. This was a mystery to me. How does one recharge if surrounded by people? I knew that I didn’t recharge in that manner. It was one of those ‘aha’ moments. I thought about the times as a child when I would go for half-day walks, or when I would wake up early in the morning and leaving my door shut, clean my room or read, hoping no one would know I was awake. I thought about how I would go alone to our neighboring Church, slip in the back door, and relish the spiritual music, relaxed in my own thoughts. Reading Quiet motivated me to retake the Myers-Briggs test. I found a free Myers-Briggs on-line test, proceeded to answer the twenty true-false questions, and was awarded an INFJ badge. The Free Personality Test site has a list of all sixteen possible letter combinations and their meanings. 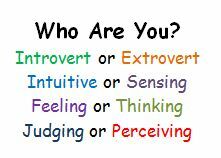 The Personality Page provides both brief and a detailed description of each personality type. Susan Cain’s Quiet made me think, question, and explore the topics of introversion, extraversion and how we all fit into today’s world. This book is not just for introverts. Rather, it is a book for anyone who supervises, manages, marries, parents, or in any way interacts with or hopes to understand an introvert. A book that does all that makes my Gold Medal List. You take the Myers-Briggs test, question the results, retake the test, research the results, and then take it again and again from other people’s perspectives. When you challenge your instructor, you do it on break rather than during the class. When someone says the word introvert, you glance around hoping nobody is looking at you. You bare your soul on social media (see Quiet, page 62). You like reading about books, talking about books, writing about books. You love researching new ideas. Waiting rooms are awesome because you get to read or write while you wait. When you are alone, you are rarely bored. When you are at a large party, you feel awkward or are often bored (unless of course you can talk about books or your latest research). You buy the book Quiet by Susan Cain, cannot put it down, and every other page is dog-eared. This entry was posted in Book Reviews, Reading and Writing and tagged Extrovert, INFJ, Introvert, Quiet, Reading Quiet, Susan Cain. Bookmark the permalink.